Be sun smart and gorgeous. Support the cause to prevent Melanoma. After our spa industry colleague and friend Alex Szekely, former president of the Golden Door and Rancho La Puerta, died of melanoma at just 44, Spafinder Wellness was inspired to make it Spafinder Wellness’s mission to educate others about melanoma awareness and prevention. Melanoma is the most serious type of skin cancer and is often fatal if not detected early. 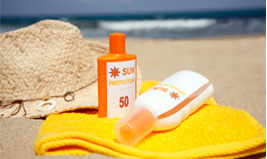 Too much sun exposure can cause normal skin cells to become abnormal. These abnormal cells can quickly grow out of control and attack the healthy tissue around them. Melanoma looks like a flat brown or black mole that has uneven edges. Melanomas usually have an irregular or asymmetrical shape. It is estimated that more than one million new cases of melanoma will be diagnosed in the U.S. this year, and an estimated 7,700 of those will be fatal. Join Spafinder Wellness in our fight against this deadly but highly preventable disease.